The Patrol Support Unit is an element of the Field Operations Division’s Specialized Operations Section. The Patrol Support Unit is further subdivided into three details, the Marine Patrol Detail, the Mounted Patrol Detail and the Canine Detail. 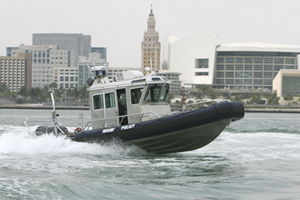 An element of the Field Operation Division's Specialized Operations Section, the Marine Patrol Detail is an extension and supplement of the patrol force of the Miami Police Department. It's primary mission is to respond to all water-related incidents, underwater recoveries and emergencies in the waterways within the City of Miami. Under the command of a sergeant, the Marine Patrol Detail provides highly trained marine vessel operators, divers, and marine theft investigators, in addition to regular marine patrol assests, to address the numerous criminal and safety issues in Miami's waterways. The primary goal of the Marine Patrol Detail is to ensure the safety of those persons using the waterways of the City of Miami. The officers assigned to the Detail enforce all federal, state and local maritime regulations and statutes, conduct inspections a variety of watercraft, and provide assistance to all law enforcement agencies and public entities engaged in maritime activities in Miami. The Mounted Patrol Detail is an element within the Field Operations Division’s Specialized Operations Section. The Detail is responsible for providing specialized Mounted Police support to specific situations, including augmenting patrol units deployed for crowd control activities where hostilities are considered minimal. 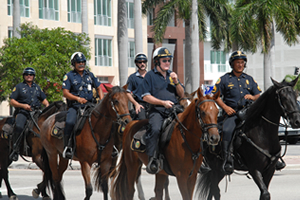 An additional area of responsibility is the promotion of a positive relationship with the Community through the enhanced visibility of the Mounted Patrol Detail at unique special events attracting large segments of the citizens and visitors in the City of Miami. In 1954, with the changing complexion of crime in the City of Miami and, increasing awareness of the successful use of police work dogs in other cities, the Miami Police Department began studying the formation of a Canine Detail. Chief Walter E. Hadley sent Captain Donald March to study other Canine Units around the country. Upon his return, he submitted a report recommending the establishment of a Canine Detail. In 1960 the Miami Police Canine Detail was formed. Sergeant J. (Pappy) Quinn was sent to the Canine Training School in St. Louis, Missouri. Sergeant Quinn was the first Canine Trainer in the new Canine Detail and helped staff and train the new Canine Handlers. The first training class was conducted in September 1960 and the second was held in January 1961. 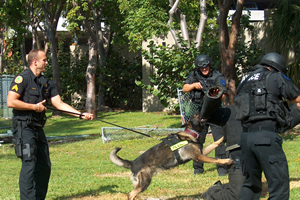 Initially the Canine Detail trained the handlers and dogs in the “London Method” of training. Over the years the training program as expanded to encompass new training methods and from ideas gathered from other Department’s training programs, seminars and publications. Our training and canine utilization have been instrumental in developing and establishing canine programs in Police Departments around the nation. The Canine Detail is an element of the Field Operations Division's Specialized Operations Section and is composed of 2 Sergeants and 18 handlers. The Canine Detail provides their higly trained canine teams to protect the citizens and visitors to Miami 24 hour-a-day, 7 days-a-week. The canine teams specialize in interior and exterior searches, evidence searches, narcotics and explosive searches and detection and any situations that require physical security capabilities which will increase the safety of officers confronting theatening situations. Additionally the detail provides specialized support for tracking and locating missing persons. With the exception of 2 bloodhounds used for the missing persons searches, all of the dogs are initially trained for basic street utility work. Then depending upon the dog’s temperament he is either cross-trained in narcotic or explosive detection. The dogs live with their handlers and ride along with the handlers as they perform their police duties. The Miami Police Department training staff provides full time training for the Detail's officers and provides basic and advanced training for other law enforcement agencies throughout South Florida. The Miami Police Department also assists other agencies in establishing and conducting a canine training program. Copyright © 2013 The City of Miami Police Department. All rights reserved.